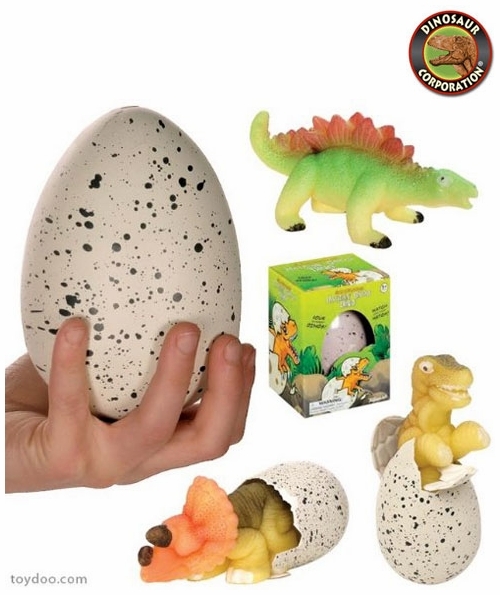 Large dinosaur egg with growing dinosaur figure inside. A perfect educational prehistoric project for kids loving dinosaurs. Hatching dinosaur egg toy in the water! Have fun watching a growing baby dinosaur break out of its own egg! 1. Put the egg in a container and fill with water till water level is above egg. 2. The egg shell will slowly break after 24-48 hours, then the dinosaur will quickly come out of its shell. 3. After the egg shell is broken entirely, add new water into the container again. The dinosaur will keep expanding until about 48-72 hours. 4. You can then move the growing dinosaur to a larger container to watch them grow! !